From the Editor: Kim Cunningham is president of the Texas Parents of Blind Children and serves as second vice president of NOPBC. She and her daughter, Kayleigh Joiner, have been members of the NFB ever since they attended their first national convention in Atlanta seven years ago. 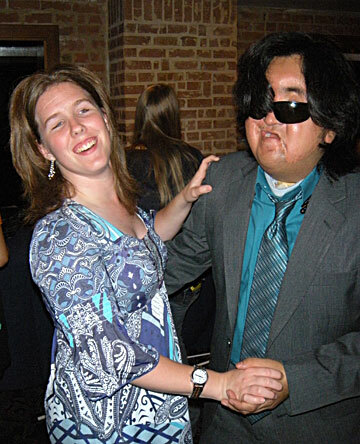 Texas Parents of Blind Children (TPOBC) held its second annual spring convention, "Quest for Independence," in beautiful San Antonio, Texas, from April 13 to April 15, 2012. TPOBC partnered with the Texas Association of Blind Students (TABS) for the second year to bring parents, blind children, and blind college students together for a weekend of education and fun. Co-hosting the convention with TABS has been a great way for parents to meet successful blind students and for the college students to mentor students in high school and elementary school. TPOBC and TABS began to plan for the convention shortly after the 2011 NFB National Convention. We hoped to put together informative and engaging sessions that would inspire families to believe in their children's abilities and to discover the path to independence. Our planning committee met monthly through teleconferences and worked out the details as time went by. Topics and speakers were carefully chosen to appeal both to students and parents. We determined to have separate parent sessions and student sessions as well as joint sessions to maximize the quality of information for each group. Upon registering, the parents were given name tags and folders with the agenda, TPOBC membership forms, and various articles from the NFB Independence Market. We also included a "Getting to Know TABS" contest form for parents. This sheet had three questions related to the NFB or its student groups. To answer the questions on the form, parents had to introduce themselves to the TABS members. Each parent who turned in a form was eligible to win a gift certificate. The planning committee also decided to have a fun new activity during the opening icebreaker on Friday evening. Students and parents were grouped into teams. Each team was given a piece of string, several pieces of uncooked spaghetti noodles, a small piece of tape, and a marshmallow. The teams competed to see which could build the tallest structure. Parents (wearing sleepshades) and blind students had to communicate effectively to engineer what they would do. The activity was great fun, and the structures were very creative. On Saturday morning, O&M specialists Joleen Kinzer and Garrett Aguillard gave a presentation on the long white cane. Kevin Markel, a transition specialist with the Division of Blind Services talked with the parents about the transition process and future goals for their children upon graduation. Families had the opportunity to learn about the National Association of Blind Students from NABS president Sean Whalen. Steve Tompkins from NFB-NEWSLINE® explained how the NEWSLINE service works and described some of the publications students might find helpful and entertaining. Larry Temple with the Texas Workforce Commission talked about the labor market in Texas and careers that are in demand. After lunch, TPOBC treated the families to a relaxing cruise along San Antonio's beautiful Riverwalk while the students went on a scavenger hunt. The cruise gave members a great opportunity to get to know the families better and talk about any concerns they might have. Despite a few raindrops, everyone enjoyed the tour. A panel of college students hosted the last session of the afternoon. An open question and answer forum allowed parents to address any issues of concern. After dinner that evening, TABS hosted salsa dance lessons for everyone. The students were encouraged to join in and enjoy the music. The parents were pleased to see their children laughing, dancing, and doing what teens do best! On Sunday morning, the group came together for some scientific fun. Henry (Hoby) Wedler, a PhD candidate in chemistry, hosted a session called "Making Chemistry Accessible, One Atom at a Time." Students and parents took part in an assortment of hands-on experiments. In one, they filled balloons with dry ice. After the balloons were tied, the air began to expand, setting off a chain reaction of burst balloons all over the room. Everyone laughed and had fun. Best of all, the students learned that they could do experiments successfully in nonvisual ways. Also on Sunday, winners of NFB-Texas and NFB national scholarships spoke to the students about when and how to to apply to these programs. The students were urged to keep their grades up, to seek leadership roles, and to volunteer in their communities. Next, the families learned about the programs available from the NFB training centers. TABS members talked about the Buddy Programs, the high school programs, and the adult rehab program. The students spoke candidly about their experiences and the independence they had gained. Members of the student and parent divisions reported on the 2012 Washington Seminar. The participants explained some of the current issues that face blind citizens and described their experiences educating their representatives on these issues. The final session of the weekend was a hands-on demonstration of Apple iOS devices. Participants visited three stations set up around the room. Kayleigh Joiner, Gabe Cazares, and Monica Villarreal demonstrated the iPhone, iPad, and Mac computer respectively. Students were shown how to turn on VoiceOver and navigate the devices nonvisually. The students were also given a list of blind-friendly apps they could purchase for their own devices. We all had a great weekend. The families left knowing more about blindness and encouraged about their children's future. I know we helped to educate the families on how to follow their "Quest for Independence." However, I must admit to being disappointed in our attendance. I had really hoped for a much larger group, as San Antonio is located in the central part of the state. For those of you in larger states, I am sure you understand! Sometimes we reach many, sometimes a few! I know we will work out the kinks as we go along. Live and learn! Very soon we will begin to plan for the third annual TPOBC/TABS spring convention!